Walmart dropped the price of $100 iTunes gift cards to $80. The new deal means that you can get 20 percent off for a digitally delivered gift card, giving you more iTunes media downloads for your buck. For your $80, you will get $100 to spend in the iTunes store for music, videos or apps for iPods, iPhones and iPads. Upon your purchase, Wallmart will send you a PIN access e-mail, as well as a unique iTunes Store code you will use to redeem the credit. The time delay from purchase to receiving your PIN can take just a few minutes, but backlogs could mean that it can take as long as 48 hours to receive your code, Walmart said. After you buy the card, you can pick whether the code is delivered to your own e-mail address, or to a friend or relative as a gift. The gift cards are not returnable, so you won’t be able to change your mind. One other caveat with the deal is that you can’t make the purchase without giving Walmart your name and details. As Fortune points out, Walmart’s policy includes sharing your information within its corporate family of companies, as well as sharing details with third parties. Walmart didn’t say how long the deal for iTunes gift cards would last, as it’s only available for the $100 card, and not for lower values. 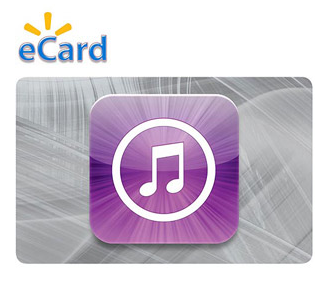 Best Buy previously ran a similar deal, offering 20 percent off $100 iTunes gift cards.